Epidaurus was a sanctuary healing center located about [30 km.] east of Nafplion. Although a number of deities were worshiped here, Epidaurus was famous as a healing center where Asclepius, the god of healing was worshiped. The well–preserved theater is justly famous although there are additional remains including a Gymnasium, Baths, an Odeon, a Temples of Asclepius and Apollo, a Tholos, and a stadium. 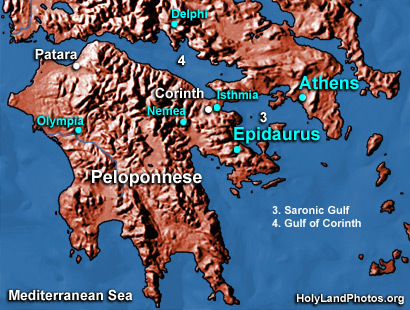 Other sites with famous Asclepieions include Corinth and Pergamum.